The DC18RD delivers the same rapid charging speeds as their single battery charger: charging two 3.0Ah batteries in 30 minutes, two 4.0Ah batteries in 40 minutes, and two 5.0Ah batteries in 45 minutes. Obviously, this charger will be especially beneficial to users with Makita 18V X2 cordless tools, who can now charge both the required 18V batteries in half the time. 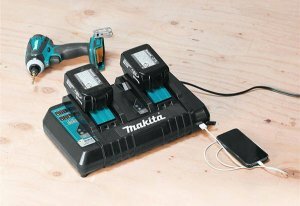 In fact, it would make a lot of sense for Makita to bundle the DC18RD with their 18V X2 tools. The DC18RD is expected to be released December 2014.